Our Cracked Pepper seasoning is derived from a traditional Brazilian preparation of grilling meat called Churrasco. We had the opportunity to taste home made Churrasco in Botiva, Brazil many years ago and luckily wrote down a recipe. We were told traditional Churrasco could be as simple as packing meat in salt before grilling. More adventurous BBQ chef's balance aromatic herbs and intensely flavorful spices to bring out the natural flavor of beef. Our recipe follows this line of thought, well balanced, flavorful and aromatic. A Brazilian dry rub beef seasoning that is fit for steak and other choice cuts of meat. Knox's cracked pepper barbecue dry rub is an excellent all around condiment that could replace your table ground pepper. Our cracked pepper dry rub is great in mashed potatoes or even to season sausage gravy. Also available in gift baskets and gift sets, click here. Cracked black pepper is a culinary standard for prime cuts of meat all over the world as well as throughout history. 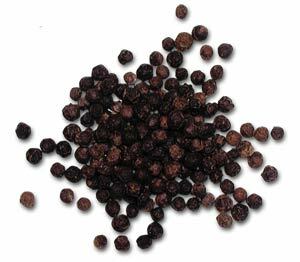 Black pepper begins to show up in recorded history about 327 B.C., and quickly becomes a local favorite for its spicy earthy flavor. Knox's cracked pepper dry rub is a superior seasoning and excellent for seasoning steak by applying directly or creating marinades with a gourmet flair. Our blend of quality black pepper and other herbs and spices adds an aromatic, peppery flavor to meats. Complimentary flavors and aroma enhances the natural tastiness of steak and other cuts of beef including hamburger. Do you typically buy seasonings and they are full of salt? Or contain some chemical you have no idea what it is? Our dry rubs are NOT mostly salt and contain no chemical additives. Just a natural blend of tasty seasoning perfectly balanced for grilled and barbecue beef, pork or chicken. We have always felt that salt is cheap, if you really like salt, add your own salt. Sprinkle liberal amounts of Knox's Cracked Pepper dry rub seasoning over buttered or oiled meat and massage. Rubbing infuses the flavors directly into the surface and helps release the flavor of the dry rub. For easy clean up, place meat and cracked pepper seasoning in a zip lock bag. Rub into meat from the outside of the bag. 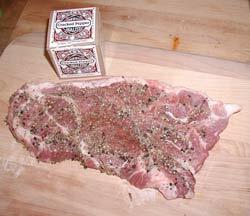 If you are going to use a meat hammer to tenderize your steak, sprinkle dry rub on prior to tenderizing. Rub by hand after you have finished. Apply several hours before grilling and refrigerated until ready or directly before barbecuing. Mixing Knox's Cracked Pepper rub with oil, melted butter or citrus is an excellent way to personalize a wet rub or marinade to be used on a brisket, roast or whole poultry. Mix Knox's Cracked Pepper dry rub with a couple of tablespoons of melted butter, extra virgin olive oil or your favorite steak sauce to make succulent steak marinades. Also a peppery condiment for potatoes and salad. • 1/2 stick melted butter or 1/4 cup olive oil and 1/2 cup *citrus juice for chicken and pork). For the citrus juice we prefer 50% orange juice - 50% lemon juice. But feel free to experiment with whatever you like. Different types of oil can also make your wet rub deliciously unique with our dry rub. A teaspoon of toasted sesame seed oil or chili oil can add depth to the flavor and personalize your wet rub. Mixtures of oil and citrus, such as 1/4 cup of lemon juice, 1 tablespoon of chili oil and 1 tablespoon of cracked pepper dry rub also creates an equally delicious marinade. Mix together melted butter or oil and Knox's cracked pepper dry rub. Spoon over steak, chicken or pork and rub into surface or place contents in a zip lock bag and massage by hand for easy clean up. If you use butter, make sure butter is melted but not hot. BBQ or grill immediately or place in refrigerator until ready to cook. Knox's cracked pepper dry rub can also be used as a sprinkle to spice up salads. Salt and pepper have been used hand in hand throughout recorded history. We have known this as Brazilian BBQ, where you take a roast, pack it with cracked pepper and salt and slowly grill it is a long standing traditional preparation and is found all over the world. Possibly the oldest and most commonly used spice in the world. Black pepper begins to surface in history around 327 B.C. from India, probably from some unscrupulous invader. Black pepper was used to pay ransoms (3000 pounds of pepper for Rome) and at times worth its weight in gold (1488 A.D.). The only history we can provide for the first human to use cracked black pepper and salt as a dry rub is that they enjoyed grilling out. Cracked pepper has many culinary uses, from salad to steak and every possible combination in between. Black pepper is found in almost every cuisine on our planet and highly prized for the mildly spicy flavor and aroma. You will find it in dry rubs as well as pickling spices and seafood boils. Knox's Cracked Pepper dry rub uses high quality black peppercorns, herbs ,spices and gourmet mill grind sea salt. Quality salt aids in bonding with the fats in meat to retain the natural moistness. Aromatic herbs finish our Cracked Pepper dry rub as a well rounded aromatic and flavorful spice blend perfect for choice cuts of meat. Cracked Pepper dry rub, at your service. Also See: Cracked Pepper Dressing and our Gift Baskets.